The 1297 Real-Time Efficiency computer allows a technician or engineer to quickly analyze the operation of switching power supplies by observing efficiency as operating parameters such as input voltage, output load or components (Such as inductors) are modified. Efficiency is the quickest measure of the overall performance of a switcher, low efficiency can point to underrated inductors, high Vforward diodes, excessive switching losses and other problems. A power supply could put out the correct voltage while at the same time converting too much of your battery power into heat. Intended for low voltage DC-DC converters, this unit has selectable ranges for both input and output voltage channels with galvanic isolation to allow for positive or negative voltage measurements. Galvanic isolation and an internal amplifier stage is provided for current measurement using 0.1 ohm sense resistors using high or low side sensing. Higher currents can be accommodated by the use of lower value sense resistors and as long as they are equal for the input and output channels, the efficiency calculation will be correct (Current an power must be scaled accordingly) . Now you can sweep your design at the bench in minutes over the whole input/output box. Want to see how that new smaller inductor compares to the fat legacy one or that new "Drop in" switcher compares with the old one? Plug them in and see! 5.000" Long x 3.210" Wide x 1.850" High black annodized aluminum extrusion housing. (Not counting DSUB-9 connector protrusion). 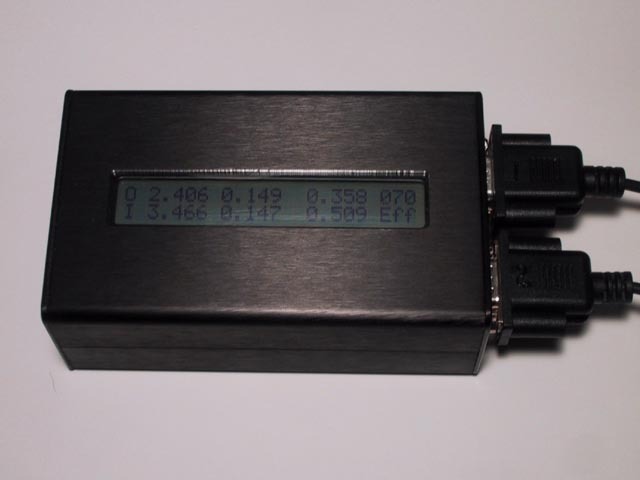 2 line by 24 character LCD display with replaceable polycarbonate protective lens. DB9-F serial interface connector for data logging, voltage scale selection, calibration and unit power. DB9-M connector for voltage and current sense. Operates from 10-15VDC/100mA wall adapter. Voltage channels (1 and 2) independently scalable at 4.000, 10.00 and 30.0VDC full scale. Current channels (3 and 4) internally amplified to accept 0 to 196mv full scale: 0 to 1.96 amps with 100mOhm sense resistors. 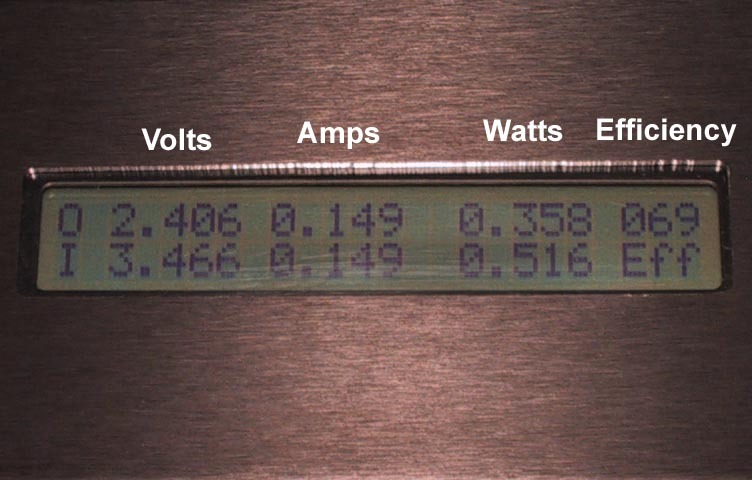 Voltage and current are converted with 10 bits of resolution and < 1% error at all scales. Signal filtering is via RC low pass with 200Hz cutoff. RS232 transfer rate: 57600 baud. Win95 and up compatibility with available RS232 port. Data logging to screen and/or Excel compatible .CSV file.